I’ve often written about plagiarism and academic integrity here. At the University of Virginia this fall, there occurred a bizarre incident indeed, according to a story by Daniel De Vise on the front Metro page of the Oct. 20 Washington Post, “Plagiarism accusation entangles editors, too”, link here. In fact, the Cavalier Daily has its own account of the event, here. What’s interesting, in the first place, is that piecing together long quotes from several sources was itself a kind of plagiarism. Maybe the author of the Cavalier story failed to give attribution. But the incident could have become an interesting one indeed had it wound up among the list of Righthaven cases (that is, had one of the sources come from the Las Vegas Journal Review or Denver Post, perhaps improbable). 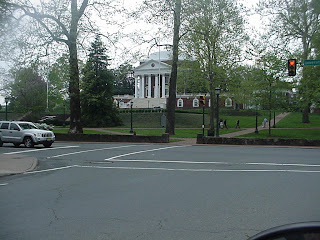 Public colleges in Virginia, including the University of Virginia, the College of William and Mary (site of my own 1961 incident), Virginia Tech, and VMI, among others, have strict honor codes and, at least with UVa (probably the others) comprehensive student government which runs everything. The Post article discusses how the Honor and Judiciary committees work. At UVa, students run everything. The Cavalier is saying that the administration needs to be able to intervene more in situations involving tricky points of the law. The newspaper editors were hauled before the Judiciary Committee for disclosing in a published editorial the Honor proceedings against the supposed original writer, said to be a violation of confidentiality and federal law. It turns out that it’s not. But it probably would have violated the law to disclose this in a personal blog. Since blogging and social media are so commonly used on campus, it’s important to consider the case in view of social media (as in the opening of the film “Social Network” which also deals with “student conduct” online -- as actor Jesse Eisenberg demonstrated so well). When I was a high school senior, I first considered the University of Virginia. I was somewhat laughed at when I said that at a party. In those days, students had to wear coat and tie to class, and were considered Virginia “gentlemen”. Thankfully, times have changed, but maybe not enough. The Cavalier reports that the Occupy protest movement will get permits in Charlottesville. Here's another resource on plagiarism.